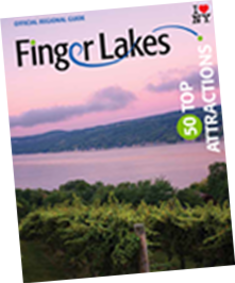 As the saying goes, “Ithaca is gorges!” One visit to Tompkins County, located in the southeastern section of the Finger Lakes Region, and you’ll fall in love with its natural splendor. Tompkins’ most well-known town, Ithaca is carved by deep-cut gorges and boasts over 150 spectacular waterfalls within 10 square miles. Taughannock (pronounced Tuh-GA-nick) Falls stands three stories taller than Niagara Falls, with a 215-foot plunge. The area’s rich cultural scene and creative spirit is fueled by its educational institutions. Nestled among woodlands and, you guessed it- waterfalls, Cornell University is the most educationally diverse university in the Ivy League. Ithaca College has an outstanding array of cultural offerings including concerts, theater productions and sporting events. The Discovery Trail puts a creative spin on learning among eight hands-on and educational, attractions across the Ithaca area. Find a new love for science, art and history as you explore the Sciencenter, dig for trilobites and walk among the glaciers at The Museum of the Earth, and learn the songs and calls of hundreds of species of birds at the Cornell Lab of Ornithology. Come hungry, leave happy. Tompkins County is home to a culinary bounty. From the famed Ithaca Farmers Market that sits on the waterfront at Steamboat Landing, to landmarks such as the Moosewood Restaurant open since 1973 and famous for its award-winning vegetarian cookbooks, Ithaca is a foodie’s paradise. Choose from a variety of eateries among the pedestrian-only Downtown Ithaca Commons, as well as Aurora Street’s restaurant row as well such as Ethiopian, Thai, Mexican, or all American. Shop the unique storefronts and peruse entertaining street performances. Cozy up to the zinc-top counter at historic Bar Argos with a creative cocktail or top your evening with an ice cream sundae at Purity or Sweet Melissa’s– Ithaca is home to the first sundae, invented in 1892. When it’s time to rest your head, choose from quaint bed and breakfasts, full service hotels, luxury inns or even upscale glampsites! The safari-style tents at Firelight Camps are furnished with hardwood floors, king or queen beds and private patios. Guests are invited to soak in the stars around a campfire, the perfect spot for sipping Finger Lakes wine and making s’mores.